Exclusivity is the ultimate luxury. It’s such a turn-on! That in a nutshell, sums up why vintage is so appealing to many, included jaded seasoned fashion veterans like myself. 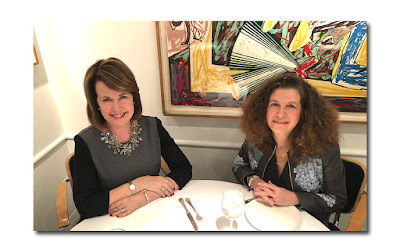 There is nothing quite like the thrill of the hunt; stumbling upon something I didn’t know I needed in my life (until I saw it), something that is exclusive and guaranteed to be one of a kind (or pretty much close to it). And let’s not forget the economics. While in some rare cases, prices for vintage are on par with retail, more often than not they are much lower which means you are getting a big bang for the buck (things were made so much better way back ‘when’). What’s interesting now, though hardly surprising, is that a new generation is also discovering its joys. More and more millennials, and those who belong to Gen Z, are starting to crave individuality, and want to own unique pieces that nobody else will have. 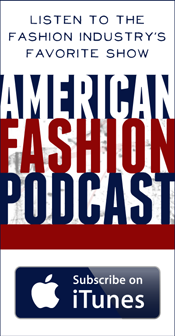 They are becoming interested in vintage looks, and in true vintage, and there are four major reasons why, according to Sara Maggioni, Director Retail & Buying at WGSN: “Nostalgia, old-school sportswear brands going through a renaissance, designers diving into archives for reissued pieces, and last but not least, Alessandro Michele’s signature maximalism; his retro aesthetic and continual use of retro vintage inspired pieces”. The most efficient ways to scour these items is by shopping on etsy.com, ebay.com, 1stdibs.com, websites such as farfetch.com (who have added vintage pieces), and online resale shops like www.vestairecollective.com and www.realreal.com (Gen Z and millennials are the fastest growing customer base of the latter). Better yet, physically go to thrift shops, vintage boutiques, and vintage shows, and see it in person. 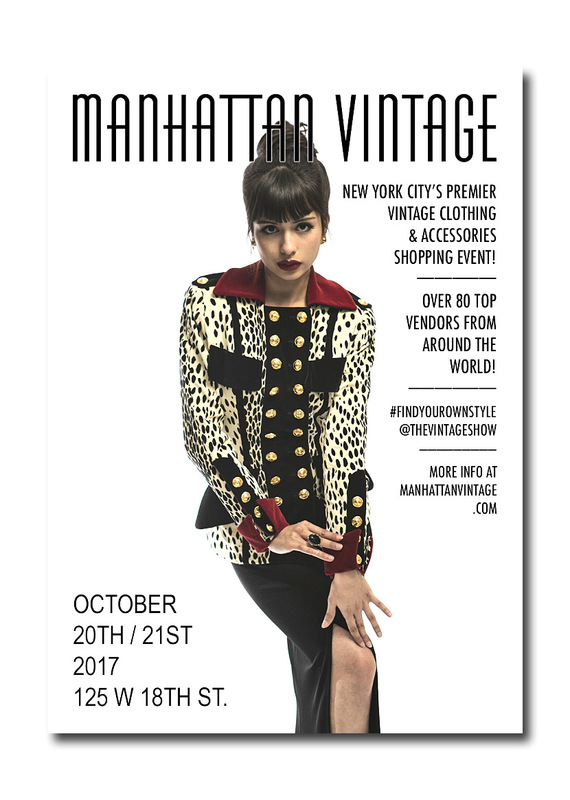 The largest, most prestigious vintage show in New York has long been The Manhattan Vintage Show. Their latest for fall 2017,was held at the Metropolitan Pavilion, 125 West 18th Street, on Friday and Saturday (the next one will be February 2nd and 3rd). It is the ultimate vintage showcase, bringing together over 90 of the country’s top vintage clothing and antique textile dealers under one roof and as such, is always a magnet for designers, retailers, editors and stylists, in search of inspiration (or just in search!). It is seamlessly produced by Maureen McGill, Adam Ornstein, and David Ornstein. David has an informed eye, is knowledgeable in all areas of fashion, and is especially adept at conception and marketing. He has been successful at merging the old with the new; bringing vintage into the current era, which is really what it’s all about. This year, he turned the spotlight on Gemma Kahng, the ground breaking designer who rose to fame in the 90’s owing to her tailoring mixed with a sense of humor and whimsy, featuring special pieces from her archives in the main lobby (I actually own the cheetah print velvet military jacket and the pink and green linen that were on display). 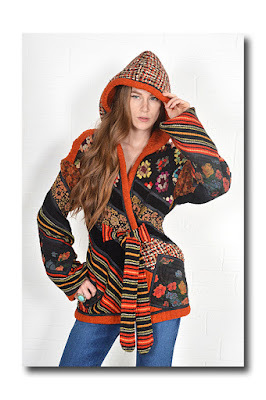 When I was a fashion editor at editor at Harper’s Bazaar, Gemma was one of the designers I covered and I fell in love with her striking, unique, couture like jackets with their fitted shapes, defined shoulders, and gloriously over the top jewel like buttons. The jackets were great then, and are great now! Trends, schmends. What’s good is always good. 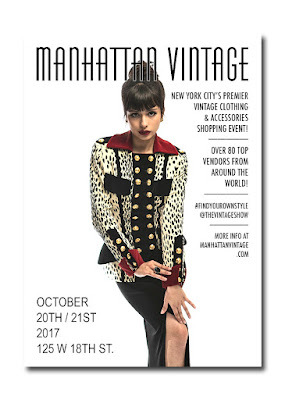 Women don’t buy head to toe designer pieces but rather, search for distinctive, special, unique items and the Manhattan Vintage Show is always a good place to start. Sure you have to really sift through, but even if you find one great piece, it’s worth it. If nothing else, it’s an eyeful and fun! 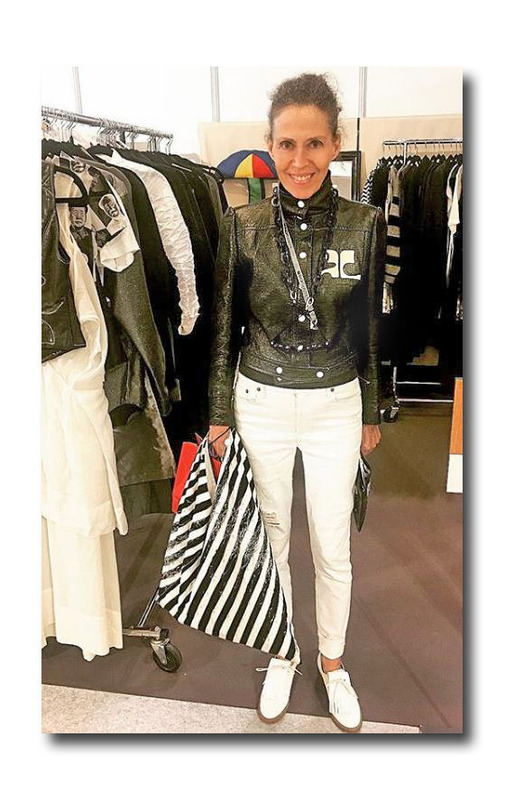 The first hour I was there, I bumped into inveterate vintage shopper Lynn Yaeger, who was empty handed but in search of something fabulous; super stylist Freddie Leiba, (who told me the best piece he saw was a YSL wrap skirt from the 70’s), and Nicole Fischelis. 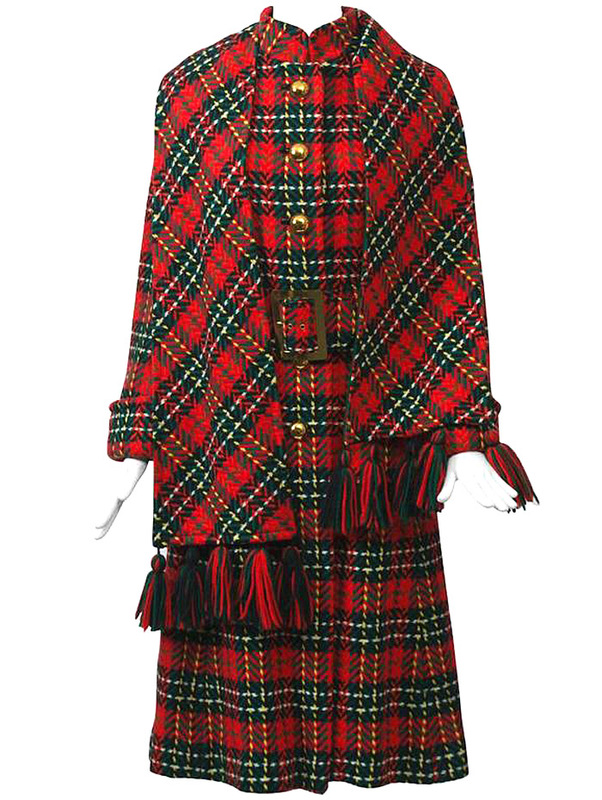 Nicole said she was also in search of the “unexpected” and recalled how last season, she found an unworn Claude Montana studded coat with voluminous sleeves. “I bought it in 5 seconds and did not even bargain!” “I am obsessed with cameos (in antique lava, shell, and Rhodonite), and found great ones this time around.” Finally, she added that she goes for “people watching”, citing the “Millennial interest” as something she is attuned to. 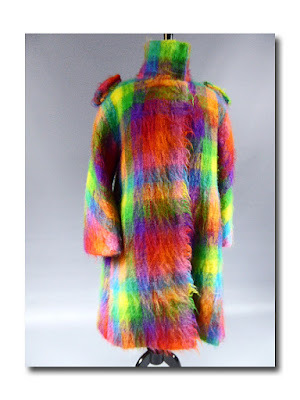 For me, it’s always about great jackets and outerwear (nothing adds as much impact to an outfit) so I was immediately drawn to Gypsy Nation’s colorful booth which had, among other treasures, two great military jackets, both couture like in construction (www.gypsynationvintage.com). One, in red, from the 30’s with removable shoulder decoration ($350), and another, from the 50’s in navy patent ($450). At Patina (www.patina-vintage.com) in addition to a group of leopard and cheetah handbags, I spotted a beautifully shaped very chic John Anthony wrap coat in pumpkin melton ($825) and an unlabeled tartan plaid coat from the 70’s with matching attached scarf and wide gold buckled belt ($475). The Jean Charles de Castelbajac colorful mohair coat ($420) at Villa Rosemaine caught my eye (www.villa-rosmaine.com). 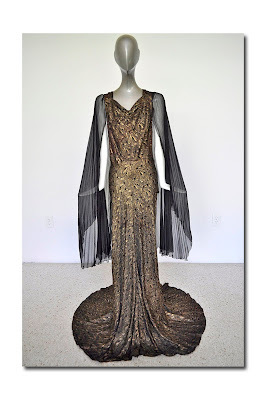 So did the disco perfect gold disc vintage dress by John Richmond, London. $350. A black velvet coat offered by Joan Goldfarb completely decorated with silver nail heads was very cool, unique, had a medieval vibe, and made an impression ($900). For more information contact jgoldfarb1@comcast.net. A 70’s Koos Van Den Akker hooded patchwork jacket from Thriftwares, $728 (www.thriftwares.com) could have walked off the recent runways (of course, I could say that about all the pieces I saw!). Vintage Le Monde’s 30’s lame gown with batwing sleeves and train is utterly beautiful and a steal at $1495 considering the material, pristine condition, and workmanship (www.vintagelemonde.com). Ah, the thrill of the hunt! See you in February.